Please find below all the articles from October 2017. Anyone who thinks the UK is lagging behind its neighbours in the East when it comes to technological innovation, might be surprised to learn how much British businesses – and SME’s particularly – are claiming in R&D tax credits. Research and development (R&D) tax credits are a valuable government tax relief that rewards UK companies for investing in innovation. 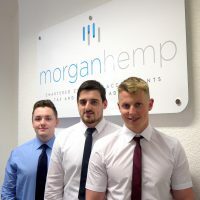 We are delighted to have expanded the Morgan Hemp team with three new recruits – all of whom we are supporting towards completing their professional qualifications. Rhydian Davies, Llew Gibson and Josh Anthony have joined us as trainees, working towards the next stages of their AAT (Association of Accounting Technicians) and ACCA (The Association of Chartered Certified Accountants) qualifications. As an approved accountancy training practice, we are committed to ensuring all our staff members build upon their professional qualifications.